Simply Fresh Foods of Buena Park, Calif., is recalling 272 cases of of San Francisco Seafood Salad Made with Greek Yogurt. The individual cups inside the carton may be mislabeled as Seafood Salad with Real Mayonnaise and does not declare "milk." The outer carton is correct and has the correct ingredient statement which declares "milk." It may be consumed safely by consumers who are not allergic to milk and have no other concern with milk. 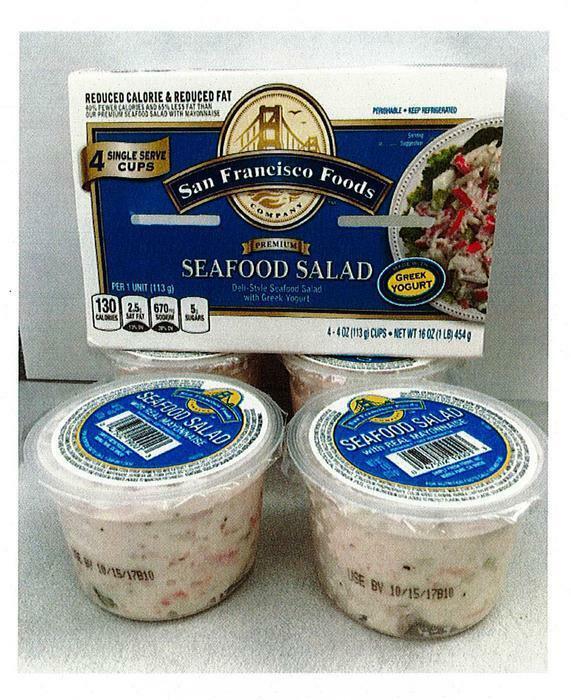 Single Serve Cup: UPC 47502 19001 San Francisco Seafood Salad with Real Mayonnaise Net Wt. 4-oz. The recalled product was distributed through retail stores in Arizona, Utah, Washington, Oregon, Indiana, and Georgia. Customers who purchased the recalled products may return it to the place of purchase for a full refund, or discard it. Consumers with questions may contact the company at 1- 855-207-2758 Monday through Friday 8:00 am - 5:00 pm (ET).